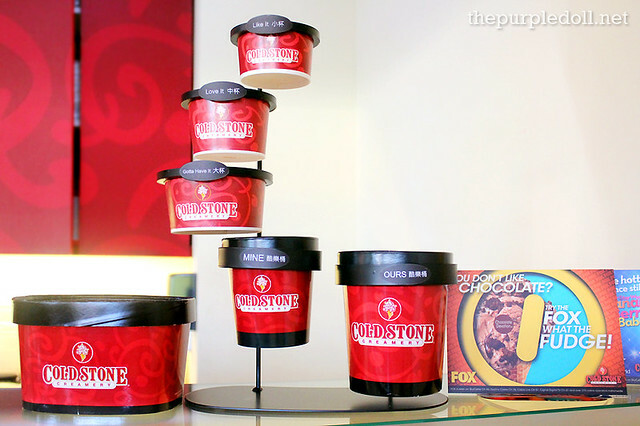 Cold Stone Creamery: The Ultimate Ice Cream Opens in Manila! 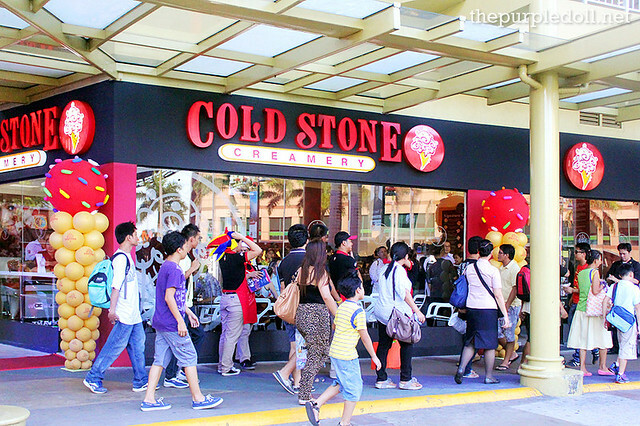 Ice cream lovers, let's all rejoice as Cold Stone Creamery, an American-based super premium ice cream parlor chain, has now arrived in the Philippines! With its offerings dubbed as the best ice cream in the United States, fellow foodies, serious ice cream enthusiasts and connoisseurs can now be treated like royalty as Cold Stone Creamery opens its doors this week in Serendra (fronting Market! Market! ), Bonifacio Global City. As an avid ice cream lover, it was a pleasant surprise to have been invited to the launch of Cold Stone Creamery together with my girls from The Foodies Circle. As a brand promising an Ultimate Ice Cream Experience through friendly and energetic service, and most importantly customizable ice cream, we found it the perfect time not just to fulfill our tasks as food bloggers, but also to really bond over great-tasting ice cream creations. Yes, you read it right. 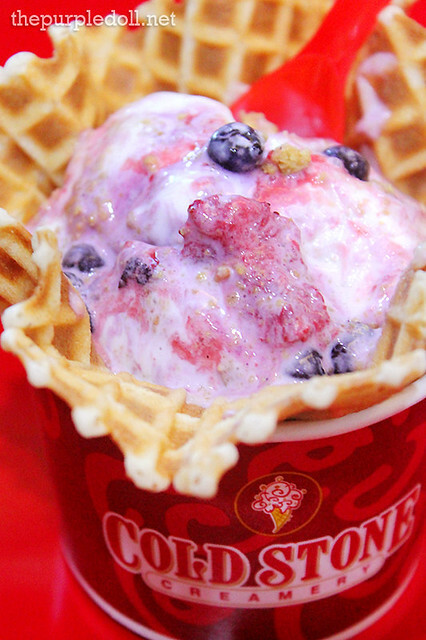 If you're new to Cold Stone Creamery, this brand doesn't only offer different flavors of smooth and creamy ice cream made fresh daily. 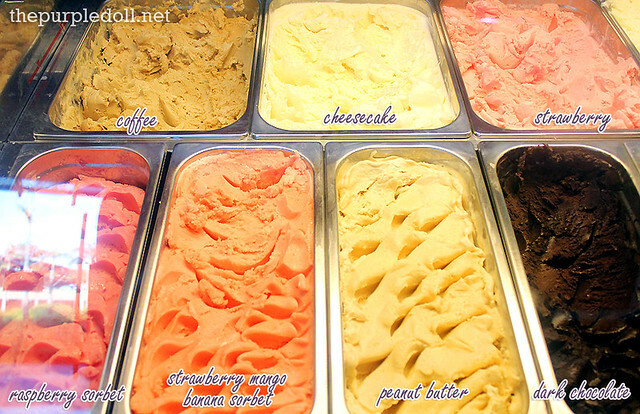 They also give guests the option to make their own ice cream creations with the addition of top quality mix-ins. So rest assured that there's an ice cream combo perfect for everyone. The ordering process is so easy, and it starts with choosing your ice cream cup. You can go for the smallest for a modest tasting portion, or go for the biggest should you want to share the ice cream with your whole family, the whole barkada, or the whole barangay. To give you an idea of the cup sizes, here's a snapshot I took. They were named Lick It (3 oz), Like It (5 oz), Love It (8 oz), Gotta Have It (12 oz), Mine (16 oz), Ours (32 oz) and Everybody's (48 oz). Don't you just love these quirky cup size names? If you're like me who loves to have waffle cones or bowls with ice cream, you can choose from Plain Waffle (P35), Chocolate-Coated Waffle (P45) or Chocolate-Coated Waffle with Sprinkles (P45), and opt to add them in. You can always have your ice cream plain if you're not much into mix-ins. Personally, I like enjoying my ice cream just by itself. And at Cold Stone Creamery, I'm sure even without any add-ons, you'd still have a good time especially since you can choose any from these 20 handcrafted flavors which are a combination of the Always Available Flavors (top row ice creams), Seasonal Flavors and Fruity Sorbets. Click menu photo to enlarge. 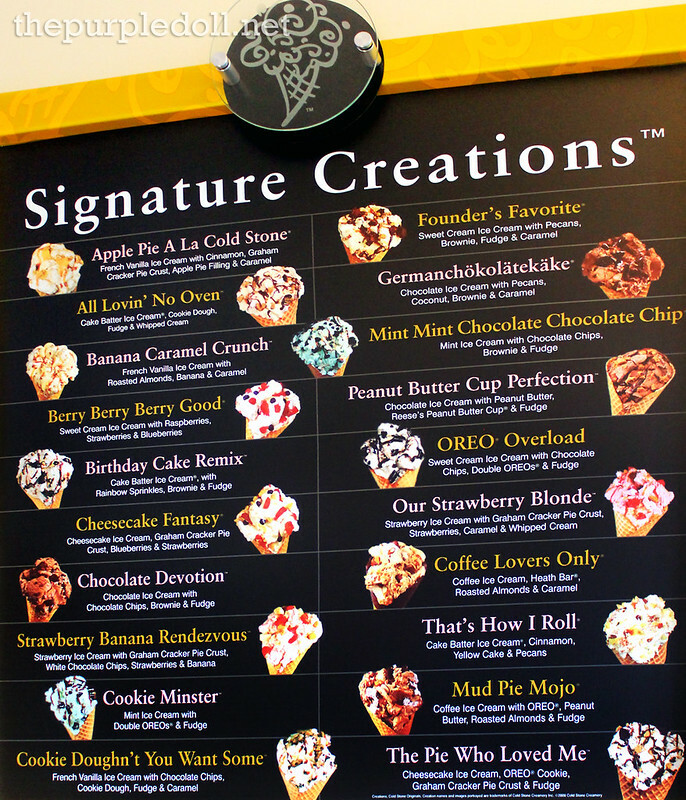 If you're not sure what to get, then you can refer to the Signature Creations menu. 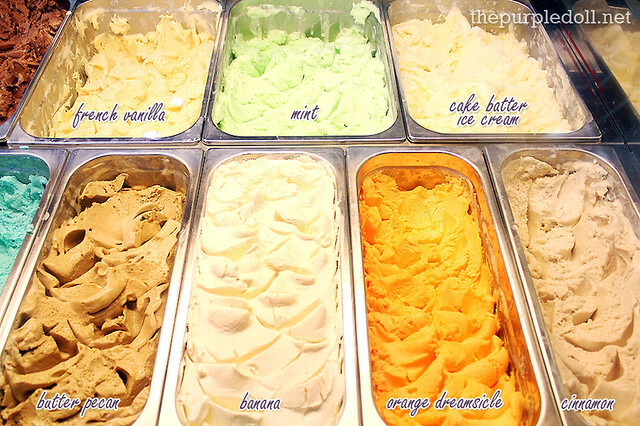 These pre-made ice cream creations will not only make your ordering process easier, but can also leave you impressed as they are time-tested favorites not just of the Cold Stone Creamery patrons, but also of this ice creamery's founders. If you're not satisfied with just plain ice cream and would want to customize your own creation, then add as much mix-ins as your heart and palate desires. 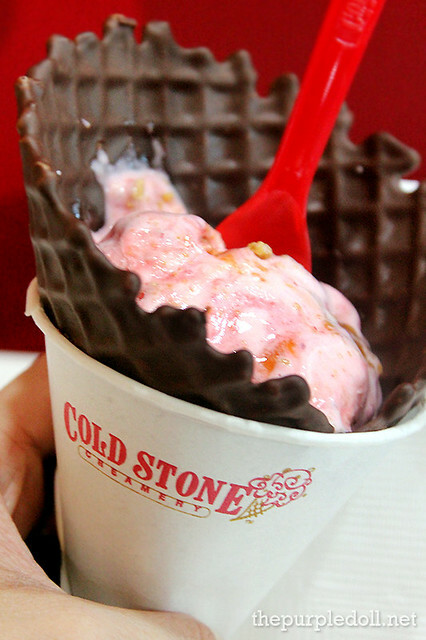 Cold Stone Creamery offers quite a number of mix-ins from candies, nuts, fruits, as well as cakes and cookies. But I think the most eye-catching for me were the dried mangoes, coconut and Hany milk chocolate as they're something truly Pinoy. The crew members even sing and chant songs while prepping an ice cream creation. 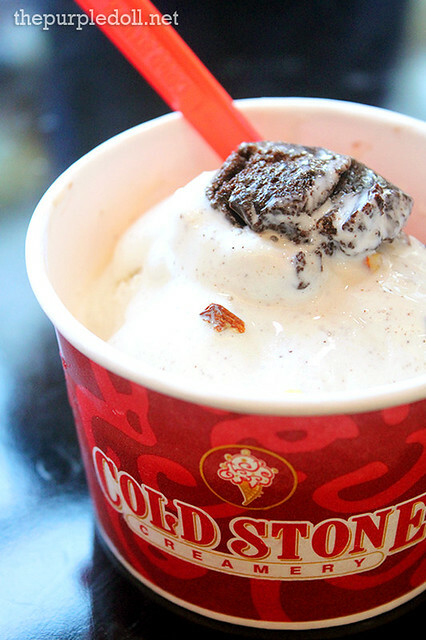 In other ice cream shops, they'll simply hand you the ice cream after scooping it out from the chiller, but here at Cold Stone Creamery, your ice cream and choice of mix-ins will first be prepared on a frozen granite stone. Aside from thoroughly blending your ice cream with your mix-ins to form a whole new flavor which means a more enjoyable ice cream eating experience for you, the prepping itself can be entertaining as the crew members would sometimes put on a show and toss the ice cream high up in the air. Time to enjoy your Ice Cream Creation! 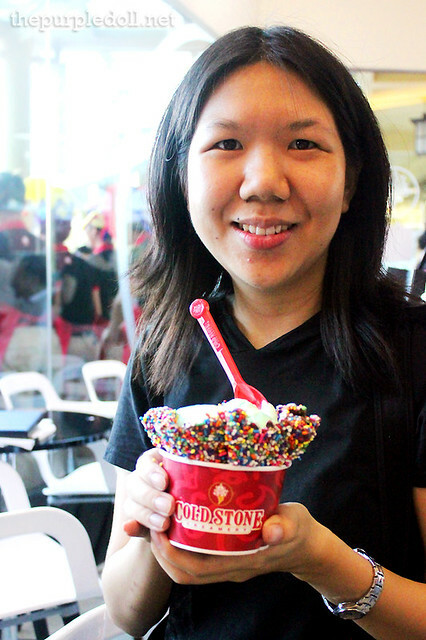 Since we're already in Cold Stone Creamery, we might as well forget dieting and just dig in. And after checking out the flavors and mix-ins, I decided to go for Salted Caramel with Pecan and Almonds. Although I've tried a lot of salted caramel-flavored ice cream, this is very different. 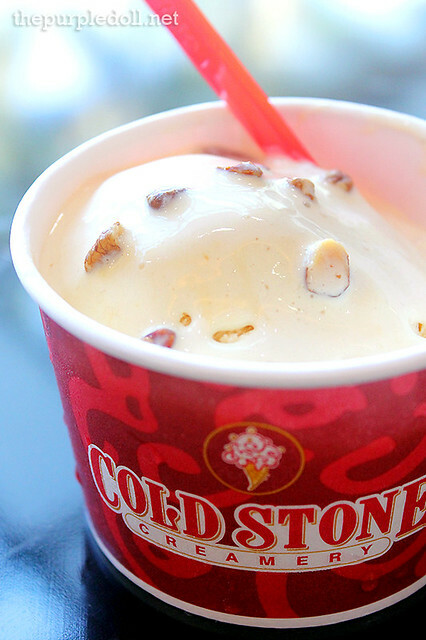 Unlike most rendition which has overpowering and heavily sweetened salty caramel taste, Cold Stone Creamery's was like a milky and creamy vanilla ice cream with subtle hints of salt and caramel. This is definitely perfect for people wanting a mellow take on salted caramel. Proof: I didn't even need to drink water after! Berylle on the other hand, got herself a Strawberry Mango Banana Sorbet with Blueberries which was light, refreshing and oozing with slightly sweet and tangy fruity flavors. For a sorbet, we expected this to be quite icy. But instead, it was smooth and a little creamy which made every spoonful more enjoyable. For some reason, I found this a little reminiscent of Jamba Juice's Banana Berry both in taste and texture. Stacy tried an interesting mix of Cinnamon with Almond, Pecan and Brownies. Like the general feedback in all our ice creams, this one is another creamy blend with a subtle warmth of cinnamon. And since the ice cream itself has a mild flavor, it became the perfect base for the earthy, crunchy nuts and the moist, chewy brownies. For round 2, I chose Our Strawberry Blonde from the Signature Creations. It's a blend of strawberry ice cream with graham cracker pie crust, real strawberries, caramel and whipped cream, and I had it in a chocolate-coated waffle cone. 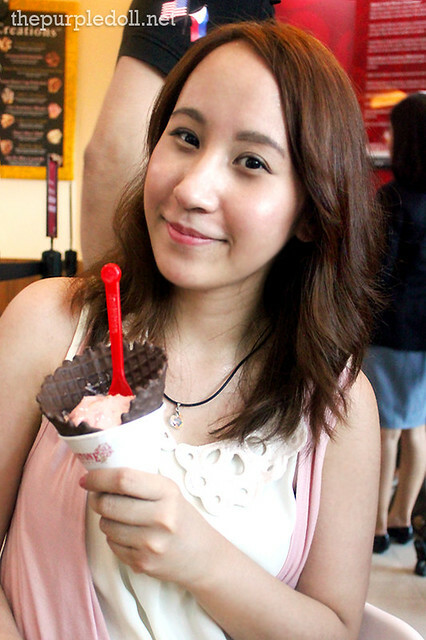 The ice cream creation itself is so refreshing yet creamy with an enjoyable tang from the real strawberry bits. The waffle was fun to eat too and reminded me of chocolate-coated Pocky sticks. As a cheesecake lover, Berylle opted for the Cheesecake Fantasy which is a mixture of cheesecake ice cream, graham cracker pie crust, blueberries and strawberries. I got a spoonful from her pick and it was really good. It tasted like real mixed berry cheesecake but in an ice cream form. The plain waffle though easily became soggy after a few minutes, but Berylle seemed to have enjoyed her Signature Creations choice still. Stacy on the other hand, made her own creation by combining Pistachio and Mint ice cream and encasing it in a crispy rainbow sprinkle waffle bowl. And as much as I was skeptical, I found myself loving the flavor when I had a spoonful. The pistachio was definitely the more dominant note, but it had a mild cooling hint that was so refreshing. 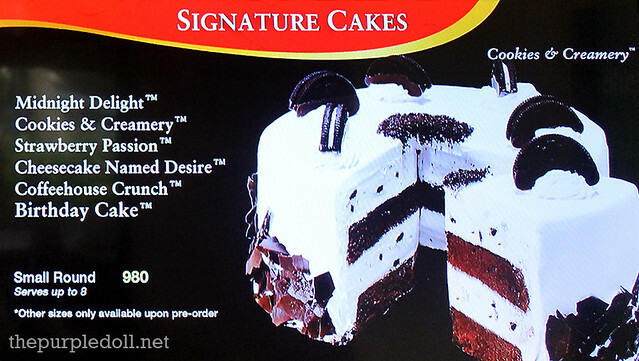 Aside from ice cream, Cold Stone Creamery also offers shakes, smoothies and ice cream cakes. I even spotted some ice cream cupcakes on their menu! I'm not sure if they'll offer those right away, but I'll be sure to try them when they become available. It was a pleasure not just to have tried the yummy treats at Cold Stone Creamery, but also to have met its president, Mr. Michael McGill. Like what he had shared with us, this premium ice cream destination is indeed for everybody -- little kids, young students, yuppies, adults, even the elderly. 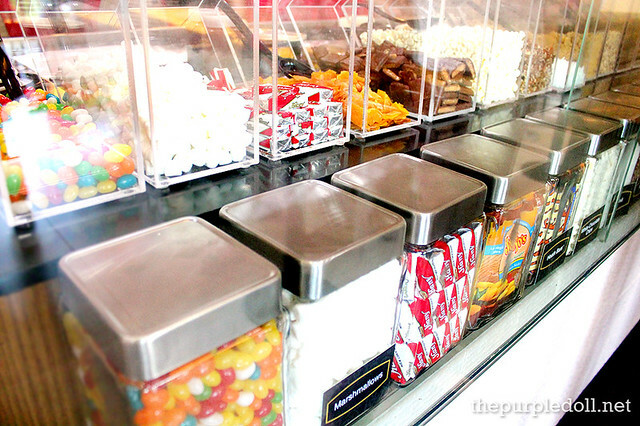 It's a happy place for anyone and everyone who wants to indulge in the ultimate ice cream experience. OMG! 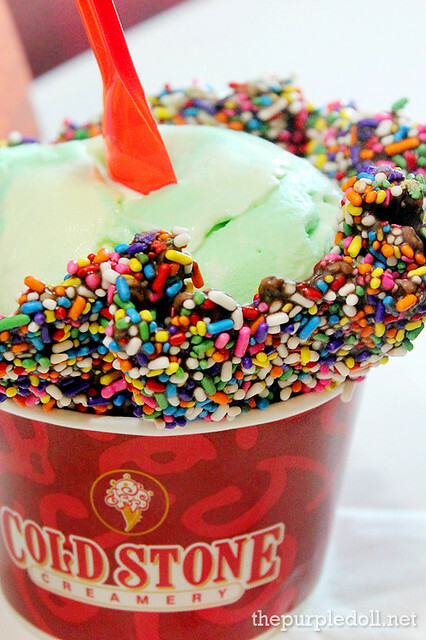 COLD STONE! 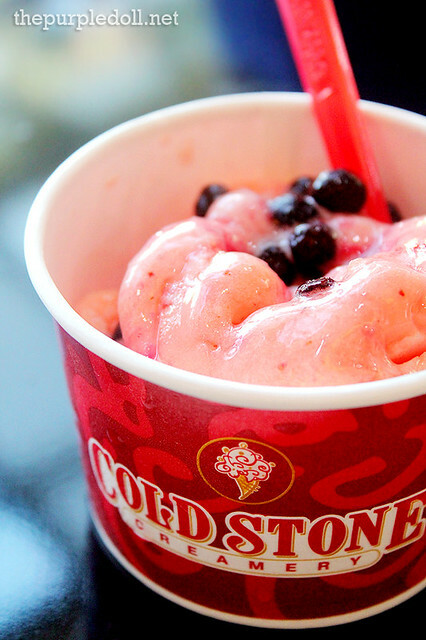 COLD STONE! It's finally hhheeeerrrreeee :D :D :D :D Can't wait to drop by there, legit. Yumm!! Cool yung thinrow yung ice cream up sa air. Was it ice cream nga talaga? Love that part of your review! I wanna try the strawberry mango banana sorbet and cotton candy. Ang taray lang ng tossing of ice cream in the air. Hehe. 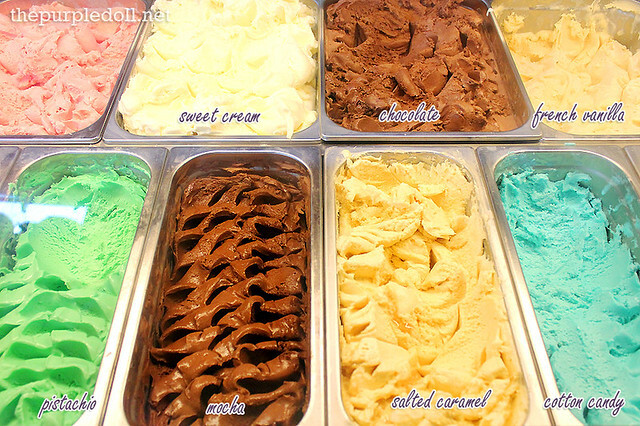 OMG, ice cream galore! 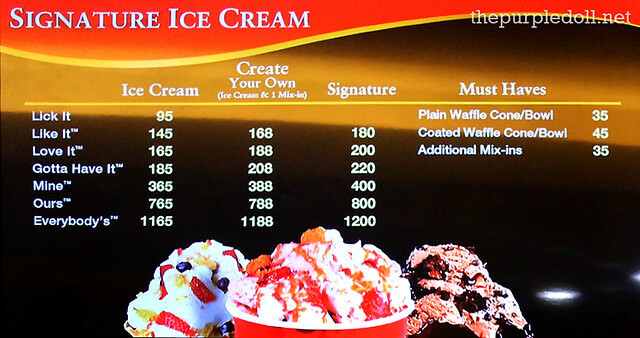 If only I were in Manila, I would surely go to Cold Stone Creamey and taste all their ice cream. I'm craving already with your photos! Cool gifs... gif me, gif me! I'm gonna send you a copy of my pics (867 pcs.) pls gif it. Thanx!!! Hahaha.. May utang pa nga ako sayong gif XD Yun muna! Oh I'd love love love to try some of these! Do they only have one branch? Running is my perfect excuse for me eating ice cream so I should be visiting this store maybe after a run. Sumi, you make a good ice cream model. As an Ice Cream Lover, I've got to give this a try. Though I've witness that concept a few years back. One in Greenbelt (I think) and the other at Robinson's Galeria (Local). ICE CREAM! 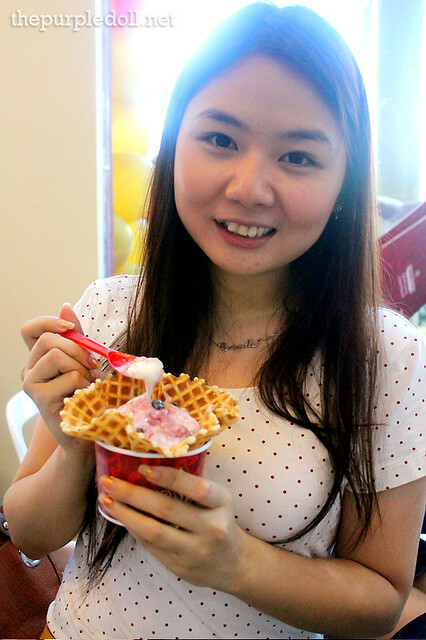 i love ice cream,my comfort food! Wow!! my weakness, my favorite, my guilty pleasure, ice cream!! Grabe, may kapalit na ang Dairy Queen craving ko. :) Must try this one after sophie's mom! wow,. nagyon ko lng nlman na may COLD STONE na pla dito sa pilinas,.